The concept behind laparoscopic surgery is to minimize the trauma to the patient. Instead of cutting through muscle and tissue, surgery is conducted using a small set of 5-10mm holes into which surgical instruments can be inserted. To this point, nothing is more egregious than having to open up a patient as a result of a surgical error. 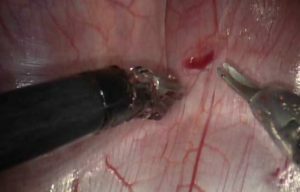 One such potential error is the possibility of cutting into a vascular element that is hidden from view under various types of tissue. Depending on the severity of the cut, the surgical team may be forced to open up the patient in order to repair the damage. To combat this potential problem, CR&D created a laparoscopic vascular probe that could detect the presences of blood flow under tissue. As with any new technology, the challenges generally arise from one or two operating parameters. In this case the device not only needed to be sterilized but also had to work in a manner that supported laparoscopic surgery. Specifically there needed to be a way to let the surgeon know the device had detected blood flow. Normally vibration would be the feedback device of choice, but when it comes to surgery, vibration is not always the best haptic feedback. Instead CR&D chose to create a visual indicator on the distal end of the device so that the surgeon could use the vision system to see when flow was detected. The device was designed to flash a small LED light at the tip when a heart rate was detected. 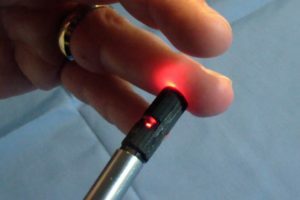 In this manner, the device acted like a vascular “stud finder”, allowing the surgeon to avoid vascular elements without adding undesirable instruments or user experience.